Every time I’ve written about Apple News recently, I’ve received comments from readers outside of the US, UK, and Australia expressing annoyance that Apple restricts Apple News to just those three English-speaking countries. Even Canada is left out! Why should this be? Part of the problem could be technical—Apple News does a lot of text parsing to recommend articles, and it would be understandable if that was currently too difficult for Apple to expand beyond English. But again, why not Canada? Could the issue be wound up in French language requirements in Quebec? The point is now partially moot for anyone running macOS 10.14 Mojave because there’s an easy workaround for people in unsupported countries—kudos to TidBITS reader fahirsch for alerting me to this trick. 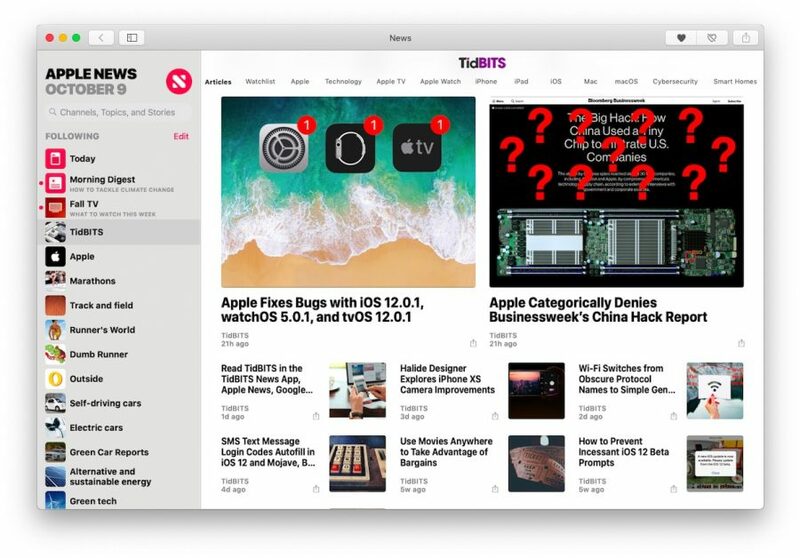 Regardless of where you live, 30 seconds of work will let you run the News app and read TidBITS and many other news sources, albeit only in English. 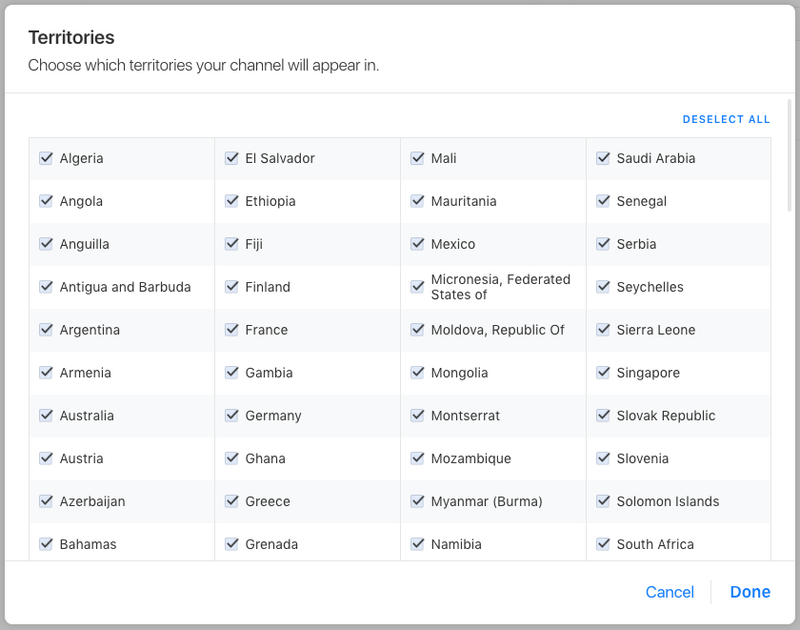 Unfortunately, several international readers say that the News app won’t allow them to access Apple’s special channels or certain other publications. I suspect that News is using IP address sniffing or another method of geolocation since I haven’t experienced any restrictions while using it in the US while the region is set to Canada. It would be interesting to see if using a VPN to acquire a US-based IP address made a difference. It turns out that News.app exists in all versions of Mojave; it’s just invisible if your region isn’t set to United States, United Kingdom, or Australia in System Preferences > Language & Region. If you change your region to one of those countries, the News app appears in the Applications folder and you can launch and use it normally. That works in iOS as well; just change the region in Settings > General > Language & Region and you’ll be able to use News there too. Unfortunately, setting a different region may have a variety of undesirable side effects. Here’s where Mojave has one up on iOS. Once the News app is active, if you move it in your Dock so it takes over a permanent spot (or Control-click it and choose Options > Keep in Dock), you can change the region back to your original country, and you’ll still be able to launch the News app from the Dock and use it. I tried simulating this approach with the Shortcuts app in iOS 12, but the shortcut I created to launch the News app there worked only as long as the region was set to a supported country. ln -s /Applications/News.app "/Applications/Apple News.app"
You can name the symlink however you want and you can locate it wherever you like—just change the second pathname inside the quotes. Needless to say, I can’t test this trick as thoroughly as someone who lives in another country, so let me know in the comments if there are other unexpected downsides to this method of opening Apple News to the rest of the world. Yes, this works in Canada. But there is a lot of things you cannot access. I also hope that if I do this, it doesn’t break anything when News support does come to Canada. Even though News returns to invisibility in Finder when I reset my region, I still get notifications from it, and clicking those opens News up. So yeah, there’s that. In France, News is available through the Open command of Terminal and I did not have to modify the country to get it. The only problem is that some entries are not available: Evening Digest, CNN and The NewYork Times. The Washington Post s available. For the unavailable items I get an error message asking me to visit the App Store. There, the only available item is CN; it is called Newsroll and costs € 10,99. But there is a lot of things you cannot access. Can you give me a list? When I’m set to Canada, I haven’t seen any difference in what is and is not available (the Wall Street Journal and Washington Post both put some (many?) articles behind a subscription wall for all regions). The only problem is that some entries are not available: Evening Digest, CNN and The NewYork Times. The Washington Post s available. When you say they’re not available, what are you seeing? When I switch to Netherlands, my spot checks in the New York Times and CNN loaded all the articles with no problems. Another reader said News disappeared when he changed the region manually, but worked fine when he used the Terminal command. It acts the same in both cases for me, but if the manual change fails, see if the Terminal approach works better. I’m in Canada and managed to open News with the Terminal command. While some news channels are available here (like TidBITS, Yeah! ), many are not (see attached picture). There must be a “region” setting for the news feeders. Weird (for me): all the news items in The Guardian are posted 8w ago, there is no fresh news. Since I can change my region to Canada and see News Top Stories, I’m guessing that Apple is doing some sniffing on IP addresses too, at least for their special channels. I’d be curious if you get the same error for any individual publications, as opposed to Apple’s collections. Morning Digest: This channel isn’t currently available in your region message. Midterm Elections: This channel isn’t currently available in your region message. News Top Stories: This channel isn’t currently available in your region message. 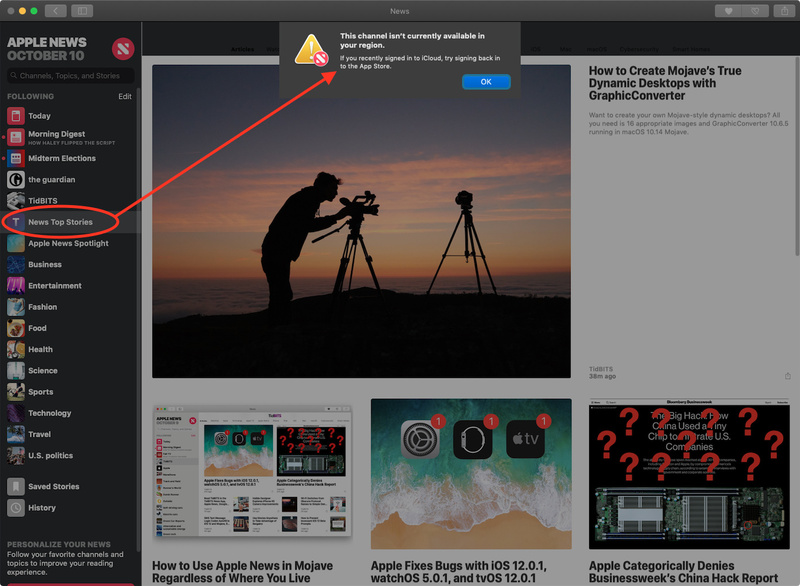 Apple News Spotlight: This channel isn’t currently available in your region message. Entertainment: many sources, but the most recent item is 2 weeks ago. Science: many sources, but the most recent item is 8 weeks ago. Technology: many sources, and the most recent item is a few minutes ago. The fact that some feeds are really out of date doesn’t surprise me, and I don’t think it’s related to the region. Apple News has long had issues with updating appropriately. You can try pulling down on the screen in the iOS versions, or choose View > Check for New Stories (Cmd-R) in the Mac version. Might work, might not—I’ve had varying results there too. I just wish I could eliminate Today and Morning Digest and Midterm Elections, none of which I ever want to see. I can confirm that the following do not work for me in Calgary, but I have not tested everything. It would be interesting if someone had a VPN they could use to change their apparent IP address to different countries to confirm that Apple is doing IP sniffing. It makes absolutely no sense that Apple News wouldn’t show Ars Technica or the New York Times in Canada (and I can see both with my region set to Canada but my IP address in the US). My guess is that this isn’t coming from Apple; it’s probably coming from the publications themselves. If they aren’t heavily invested in selling advertising or subscriptions in these markets, they probably don’t want to invest in editors dedicated to submitting stories to News. Another factor could be that the topics you ️ frequently aren’t those that editors they have are submitting often. Although I do have many local New York City topics selected in News, and a majority of the publications I’ve selected are New York City oriented in their print edition, like the NY Daily News, New York Magazine, Gothamist, etc. But unless it’s a local story with national/implications, I never see anything of true local interest. Advertising makes up the bulk of revenue for the vast majority of digital and print periodicals. I worked in ad sales for decades, including for publications with significant international circulation numbers and with clients with major global circulations. Did any of the powers that be in their US divisions, US product or ad agencies care one iota about whether anyone outside the US saw an ad of theirs? Not one bit, because their futures depended only on US or local market sales. Ah! You may be right, @MMTalker. When I look at my Settings in Apple News (as a publisher), I can specify territories.